Do Modern Horror Movies Contain More Jump Scares Than Older Movies? – Where's The Jump? Do Modern Horror Movies Contain More Jump Scares Than Older Movies? A common complaint about modern horror movies is that they are overly reliant on jump scares to generate audience thrills. Often these scares don’t feel “earned” because the director has put little effort in building up to these moments so that the jump scares are merely startling and an annoyance to viewers rather than being truly scary. 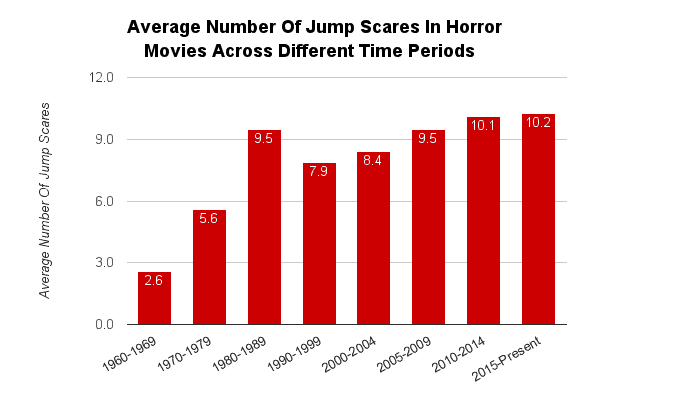 Using data from the 250 movies on our website we looked at how the average number of jump scares in horror movies has changed over time. This data is presented in the table below. There appears to have been a gradual increase in the frequency of jump scares with a spike occurring during the 1980s. In recent times, the number of jump scares per movie seems to have leveled off at around 10 scares per movie. The first jump scare we have on record is the Lewton Bus scene in Cat People (1942). This is followed by an 18 year gap until the next recorded jump scare when Arbogast gets stabbed on the stairs in a scene from Psycho (1960). Jump scares were certainly present in movies from the 1960s and 1970s however they were used sparingly with just one or two in movies such as Wait Until Dark, The Omen, Carrie, and The Texas Chainsaw Massacre. The only movies from this period with a significant number of jump scares were Alien, The Exorcist, and Halloween. The 1980s brought about the rise of the slasher sub genre where characters were killed off in gruesome, sudden fashion. Each characters death was often accompanied by a jump scare and as a result the jump scare became a commonly used technique. 21 movies in our database have more than 20 jump scares: 13 of these are from the 2010s, 6 from the 1980s, and only 2 from the 1980s.